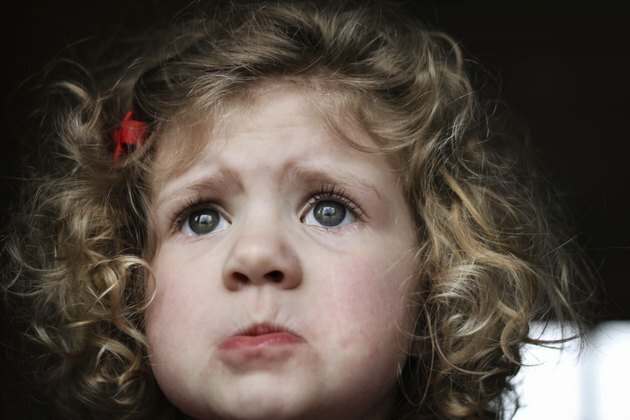 What Causes Behavioral Problems in Children? If your child is frequently out of control or often exhibits aggressive behavior such as biting, kicking or throwing temper tantrums, he may have a behavior problem. Bad behavior can also come in the form of verbal confrontations such as bad language or back-talk. Behavioral problems are treatable through parental discipline techniques or the help of a professional. The first step is identifying the cause of the problem. A child’s behavior is a product of his temperament. A child with a strong temperament is more likely to have behavior problems than a child with a mild temperament. Temperament is controlled by genetics, according to the North Carolina State University Cooperative Extension. The researchers describe three types of temperament--easy, sensitive and feisty. The group claims that 15 percent of children are born feisty. These are the children who tend to have behavior problems. Behavioral issues may also be a result of biological factors like visual impairments, speech disorders and motor disabilities, explains the National Association for the Education of Young Children. A report by the National Association of Social Workers suggests that children in impoverished families often exhibit behavior problems. These children tend to be hyperactive and aggressive. Their out-of-control behaviors can lead to poor performance in school and delinquency. One reason for this connection is negative feelings and lack of attention from parents who are experiencing economic stress. The longer the poverty persists, the more troublesome the behavior will be. When children are in an unsuitable environment, they are prone to act out. NAEYC lists an overcrowded child care facility or a household with insufficient toys or activities as examples of unsuitable settings for children. Lack of playthings or attention can lead to jealousy and then hostility between children. The group suggests putting yourself in the position of your child to determine how many toys or activities are necessary. Sometimes children use bad behavior as their call for help. For example, if the youngest child in a family feels powerless against her older siblings, she may act out. She may feel that biting, for example, is a way to get parental attention when older siblings are dominant. Children, Youth, and Women’s Health Service suggests that parents offer more protection to the youngest child to help prevent bad behavior. Another technique in this situation is to urge the older children to be kinder and more mindful of their younger sibling.